PLANO, TX -- (Marketwired) -- 07/05/16 -- Torchlight Energy Resources, Inc. (NASDAQ: TRCH) ("Torchlight" or the "Company") today announced that it has received scientific information back from third party providers who performed the testing on the University Founders B-19 #1 well. A series of logs were run and analyzed including a triple combo log, a cased hole log, a lithoscan and a sonic imaging log. In addition, 25 sidewall cores were produced in the primary pay zone. "We are encouraged with the initial results from the scientific component of the Founders B-19 #1 well," stated Rich Masterson, Torchlight's consulting geologist. "The scientific information gathered to date gives every indication that the University Founders B-19 #1 well is as good or better than the Rich A-11 #1 well. To this point in the geological evaluation, rock brittleness looks very good with low frac gradients, good oil cuts in samples and cores and excellent porosity and matrix permeability for oil shales. We are also seeing good calcite and dolomite cementation and low clay content. The University Founders B 19 #1 well is comparing closely to analogies in the Midland Basin Wolfcamp A and B and Lower Spraberry. Production will be validated once the frac is delivered in the coming weeks and providing a successful frac is delivered, the rocks are viable for production." Following the subject well reaching total depth, Schlumberger ran Triple Combo logs and drilled sidewall cores in the open hole. 4 ½ inch casing was cemented in the well bore and Schlumberger ran a Cement Bond Log that indicated a good cement job to 4880 feet. This depth correlates 750 feet above the uppermost potential perforation in the Upper Pennsylvanian pay. Schlumberger also ran Petrophysical and Rock Mechanic logs with sidewall core information from tight rock analysis being integrated. A comparison of the range of geological parameters between the subject well and Torchlight's nearby University Rich A-11 #1 well is below. 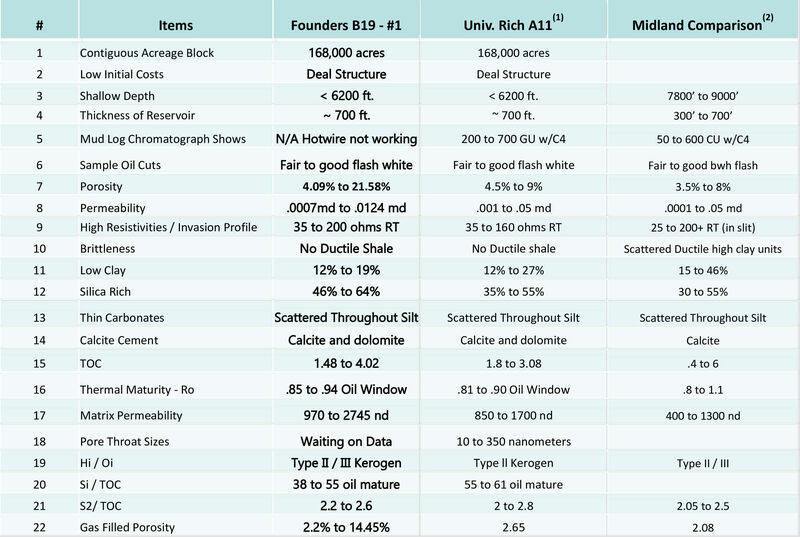 The following table gives a side-by-side comparison of the University Founders B-19 #1 well and the University Rich A-11 #1 well. "The scientific information collected thus far further validates the geology," commented John Brda, CEO of Torchlight Energy. "We are looking forward to performing completion procedures in the coming weeks to identify oil productivity and potential for future horizontal development." For the full slide comparison, please click the following link: Well Comparison. Torchlight Energy Resources, Inc. (NASDAQ: TRCH), based in Plano, Texas, is a high growth oil and gas Exploration and Production (E&P) company with a primary focus on acquisition and development of highly profitable domestic oil fields. The company currently holds interests in Texas and Kansas where their targets are established plays such as the Austin Chalk, Eagle Ford, Morrow, Wolfcamp A&B, and WolfPenn formations. For additional information on the Company, please visit www.torchlightenergy.com.